Several people have expressed interest in joining us to climb Mount Kilimanjaro. We’d love to have friends from home join us for that adventure! We decided to climb the second week of June. We will meet in Moshi on Monday, June 7 and start the climb on Tuesday. 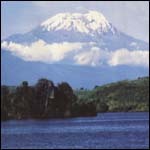 Plan to spend 6 days on the climb, which means we will be back in Moshi on Sun June 13. Climbers usually fly into either Nairobi, Kenya or Dar Es Salaam, Tanzania. If you leave Denver on Thursday June 3, you will arrive in Nairobi (or Dar) on Friday evening. Plan to spend the night there. On Saturday you can take a matatu (shared minibus taxi) to Moshi, where you will arrive Saturday evening. If there are only one or two people who end up climbing with us, we will try to meet you at the airport and drive you to Moshi. If there are more than that, we’ll need to get a taxi or something anyway, so we’ll just meet you in Moshi. A quick check on Cheap Tickets gave me a round trip cost of about $2000 Denver to Nairobi. I’m anticipating about $1000 for the climb itself. This is all-inclusive for our time on the mountain. Also, budget some money for ground transport, lodging, and meals. A guide and at least one porter is required on Kili. Jen and I will arrive in Moshi a few days ahead of our climb to organize a tour company. For those of you who want to do more than just fly in, climb, and fly out, there are numerous options for game drives and safaris in Tanzania and Kenya. You can do anything from a one-day game drive organized out of Moshi to a multi day camping Safari. Jen and I will be driving to Botswana for two weeks in the Moremi game reserve during the end of June and beginning of July. If you have the time, you’re welcome to join us for that trip. Reservations are required for that park, and we can provide contact information for the park service. There is a slight chance that due to the uncertainties of travel in Africa, Jen and I won’t make it to the climb. For that reason, I recommend leaving a couple of spare days to organize a climb in Moshi. This can be done easily, as there are many guiding companies looking for clients. If everything goes smoothly, those extra days can be spent looking for Animals (see above). Michael Batey has agreed to look into other options for less expensive airfare and will send out information to the email distribution. Nick Seemiller is taking care of keeping the group organized and is serving as a central point of contact. His email is nick.seemiller@cendant.com. I can be reached via email at wittsparks@yahoo.com. Once we hit Africa I may not be checking email as frequently. If you’d like more information about the climb itself, I’ve been using “Kilimanjaro and Mount Kenya – a Climbing and Trekking Guide” by Cameron M Burns for my planning. There’s also lots of information on the internet. I’ll try to find a couple of good sites and post links here. This information is very preliminary, and I’ll be updating it as I learn more. I currently have an email distribution list for people who have expressed interest in joining us. If you’re not on that list and you’d like to be, please send me an email.